© 2008. 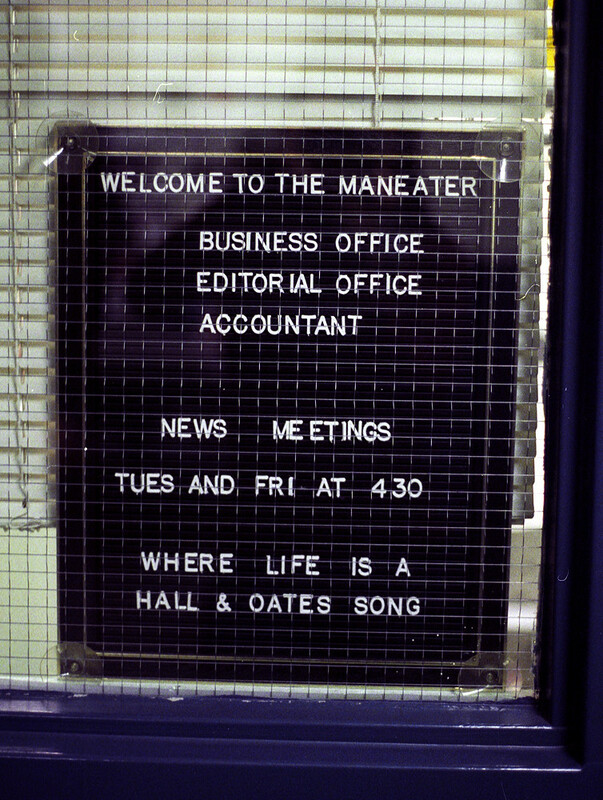 The sign outside The Maneater's door in the old offices. Taken in Feb. 2008 on Fuji 800 film. The Maneater — the official student newspaper of the University of Missouri — has deservedly encountered a lot of heat recently because of poor decisions made in the publication of its annual April Fool’s issue. For those unfamiliar with background information, The Maneater is a student-run campus newspaper that’s (almost) financially independent of the university. Because journalism-major upperclassmen are usually engrossed in their sequence work and in the journalism school’s various affiliated newsrooms, the majority of the Maneater staff is underclassmen. © 2008. 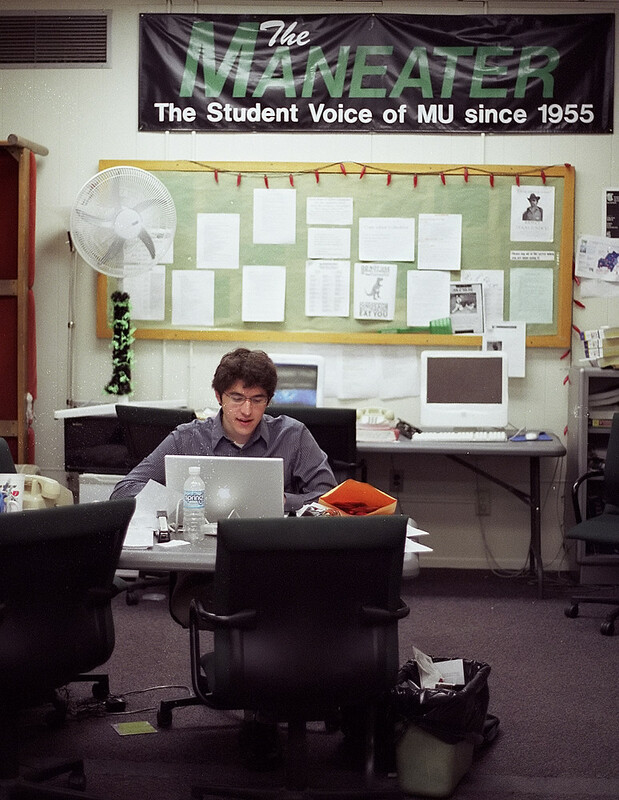 News editor Elliot works in the newsroom in Feb. 2008. Taken on Fuji 800 film. As a former Maneater photographer (2006-07) and photo editor (2007-08), I’m now reviving a belated defense that I drafted almost exactly two years ago, albeit for different reasons. I am also writing this as my own, personal response to a letter another former Maneater editor wrote in support not of the current editors or their decisions but, rather, in support of the newspaper’s status as an independent entity from the university. But we would not be where we are today without The Maneater and we echo the sentiments of Maneater alumni who continue to support the paper and the best university in the country. I’m not proud of the language used and decisions made by the editors who have since resigned. But I’m proud to have been a staffer and editor at The Maneater. What’s more, I count myself lucky for it: True to Derek’s words, I know I wouldn’t be where I am today if not for that paper. I came to Missouri in 2006 fully intending to pursue reporting and joined the paper as a designer and reporter, but — to the chagrin of my parents — began picking up photo assignments. My editor Rae couldn’t have been more patient or helpful. I can say with absolute certainty that I was among the least technically proficient photographers on staff, but Rae challenged and encouraged me. I picked up more and more assignments; learned from fellow staffers about exposure, techniques, gear, composition and more; and eventually was hired to take Rae’s place as photo editor the next year. If not for The Maneater , it might have been years before I picked up a DSLR camera or learned anything tangible about photojournalism or storytelling. If not for The Maneater, I wouldn’t have been offered my first internship. Who knows where I’d be now, had I not landed that first berth of professional experience? © 2007. 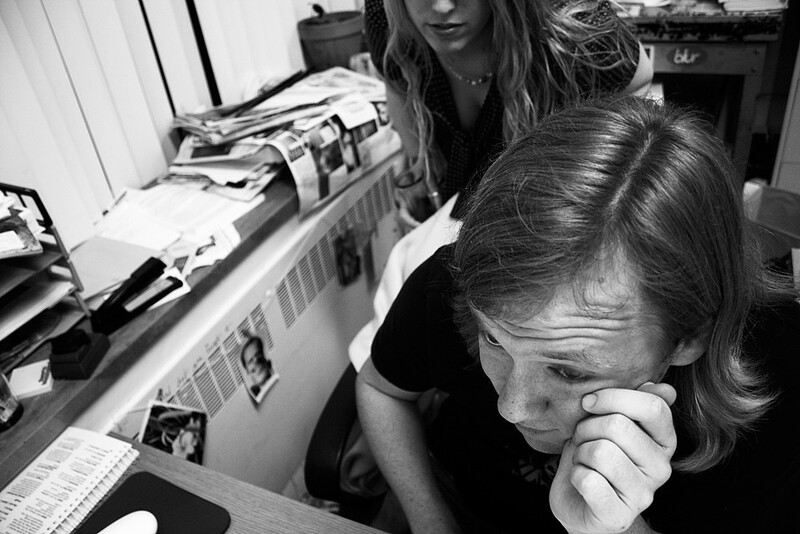 Ryan - Rae's predecessor as photo editor - takes over the photo desk as former copy chief Jamie peers over his shoulder during production night. As unprofessional as others — including journalism school faculty — may perceive the Maneater to be throughout the years, that was not at all my experience. Rae and the other editors were strict about staffers’ behaving professionally and respectfully in the field, and we were always expected to come back with a story or photos, no matter how difficult the circumstances or subjects were. When the 2007-2008 editorial board took the reins, we did our absolute best to carry that torch of professionalism. The Maneater trains and helps underclassman journalism students in a way that no pre-sequence class did, at least when I was still in school. Even if it’s “just” a story about a student organization’s barbeque, staffers are learning how to report, interview, write, take photos, produce multimedia and more. They are learning all these things by doing them for public consumption (not just a class) — an incredible opportunity that the journalism school doesn’t afford most students until their third year of college. Speaking from a photojournalism perspective, I believe that former Maneater photographers constitute the majority of in-sequence photojournalism students who are already good or above-average storytellers and who are technically proficient. 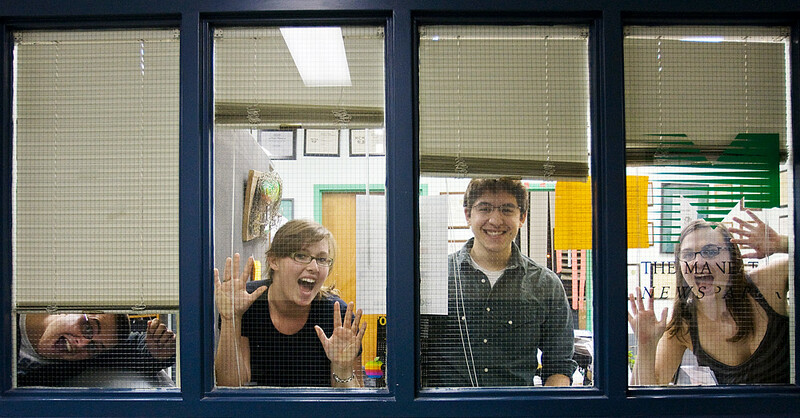 Of course, many students are good at what they do without having worked at The Maneater. But my observation is that most of the students who enter the sequence already comfortable with themselves as proficient photographers are those who’ve worked as Maneater staff at some point. I’m not saying that we at the ‘eater were always all business. There were impromptu wrestling matches in the newsroom, the copy desk kept a near-sacred toy dinosaur and I tortured my photographers by opening every production night in the photo cave with Old Crow Medicine Show’s “Wagon Wheel.” Maneater people worked together, lived together, studied together and went on adventures together. It was college. © 2008. News editors Michael, Anna, Elliot and Roseann take a break during one of the 2007-2008 staff's last production nights in May 2008. To the current Maneater staff, and other student journalists: You are still young, so make your mistakes now and learn from them. (I did.) You’ve got a lot of years ahead of you, so buckle up, take the wheel and enjoy the ride. To everyone who’s jeering at and judging The Maneater: Stop. The editors who resigned have learned their lessons. They weren’t the first (student) journalists to err, but they won’t be the last. Life goes on. This, from my prospective, is the ultimate takeaway: Maneater staffers and editors mess up sometimes. But more often than not, they get it right when it comes to helping along the next generation of student journalists and upholding the newspaper’s reputation as a passionate, forward-thinking place to work and learn.